I would think that when you start writing a book you have a certain reader in mind. It might be a hazy image but you must believe there is a person out there to whom your book would appeal. I wonder who Beata Tadla had in mind? An extra-terrestrial? A coma patient with amnesia? I am honestly lost – I really don’t know who this book was written for. 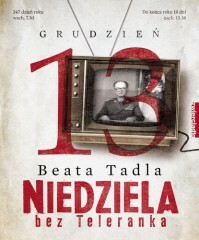 “Niedziela bez Teleranka” (Sunday without ‘Teleranek’ – a popular Sunday morning program for children)* talks (supposedly) about the life in Poland during Martial Law. The book’s glossy pages are heavy with photographs and interviews. They're organised by subjects like photography, shopping, food, toys, TV, music, fashion, etc. In theory this should work perfectly (especially for someone like me, researching for a novel set in those times). I could even forgive Tadla for writing as if she were writing for an idiot, explaining that people used landline phones, where you had to dial a number, and that those phones didn’t have internet. I could also pass over the fact she completely mixes up everything – things that were specific to those 1.5 year of Martial Law, things that were specific to communism in Poland and things that were just the international reality in the 1980s (like the lack of internet). Ok, Tadla is writing for her 13 year old son who knows nothing of last century and believes the internet was invented around the same time as the wheel. Ok, I’ll ride with that. Seriously, who is this written for? We all know that there is internet and shopping centres, and that the meat is no longer rationed. Unless, of course, you’ve just woken up from a coma. But then you wouldn’t need the first part of the chapter explaining what your life was like before the coma. Unless you also had amnesia. But, realistically, how many people in Poland woke up from a coma after 20 years and also have amnesia? Strikes me as a rather narrow target audience. I’m giving this book two stars, rather than one, only because it did have quite a lot of nice photographs and some of the interviews were interesting, provided that the author actually let her interviewee say what he or she wanted to say rather than asking them stupid questions that already included the answer she wanted to hear (i.e. “Bladdidy blah, blah, right?”, so the poor interviewee could only say “right”). I think Tadla should stick to presenting news and breakfast shows. 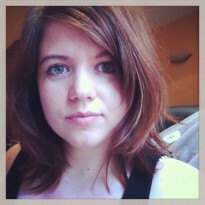 Or, I don’t know, looking pretty. *Most people who were children during Martial Law would remember its first day mostly by the fact that instead of their favourite Teleranek there was a sad looking General droning on about something.